The Auk Vol XXXVI 1919 p. 542-546	Dwight, Larus fuscus and L. affinis. THE RELATIONSHIP OF THE GULLS KNOWN AS LARUS	FUSCUS AND LARUS AFFINIS. by: JONATHAN DWIGHT, M. D.
In approaching many of the problems in modern systemic ornithology, one is confronted with the necessity of steering a middle course between the Scylla of imperfect knowledge on the one hand and the Charybdis of nomenclature on the other. Either may bring us to shipwreck; but mindful of those who have preceded me in writing about the Lesser Black-backed Gull (Larus fuscus), and the Siberian Gull (Larus affinis), I venture with some hesitancy to take up the tangled question of the relationship of these birds and make another endeavour to fix the proper names upon them. Larus fuscus, an abundant European species, was described in 1758 by Linneaus, and has never been taken on the American side of the Atlantic. L. affinis, however, has stood as a North American species in the A. O. U. ‘Check-Lists’ on the strength of a single specimen, the type taken in southern Greenland and described by Reinhardt in 1853 (Videnskab-Meddel., p. 78). Until 1912 these two gulls were recognized as two full species, and then Lowe (Brit. Birds, VI, no. 1, June 1, 1912, pp. 2-7, pl. 1) started the ball rolling by restricting the name fuscus to Scandinavian birds and describing the paler bird of the British Isles subspecifcally as brittanicus. A few months later Iredale (Brit. Birds, VI, no. 12, May 1, 1913, pp. 360-364, with pl. ), borrowing the type of affinis from the Copenhagen Museum, where it had rested for half a century, and comparing it with British specimens, found it to be identical with them; but not content with synonymising brittanicus with affinis, he reached the conclusion that the Siberian bird was larger and therefore required a new name - antelius. lt is at this point I purpose taking up the question which resolves itself into two parts, one, ornithological, concerning the relationship of the gulls under discussion, the other, nomenclatural, concerning the names to be used. At least I may contribute information that I have acquired from the examination of considerable material available in this country. Briefly then I may state that the specimens I have brought together confirm Mr. Lowe’s claim that there are two intergrading forms of the Lesser Black-backed Gull, one with a brownish black back or mantle that breeds in Scandinavia and probably southward and another with a paler, slaty mantle that breeds in northern England, Scotland, the adjacent islands, and on the northern coast of Russia. But as for names, there is an extensive literature bearing upon this Gull and it is perhaps worth while to outline the history of some of the names that have been used. p. 394), Lesson (Traité, 1831, p. 617), and Temminck (Man. Orn. 2d ed., 4th pte., 1840, p. 471), but all of these writers seem to refer without question to fuscus. 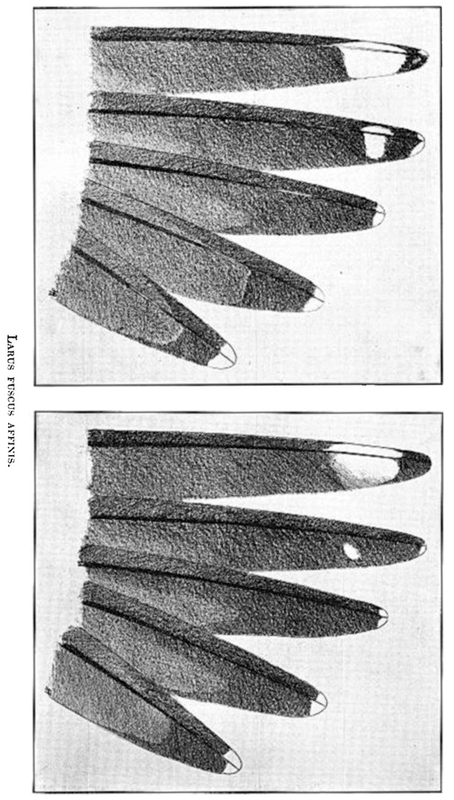 As for Larua cinereus (Leach, Syst. Cat. Mam., etc., 1816, p. 40), it would be a difficult matter to allocate this name. As early as 1822 Brehm and Schilling (Beitr. zur Vogelkunde, III, pp. 735+) gave elaborate descriptions of the plumages of the Gulls, but apparently confused the black-backed species under “maximus" and "marinus.” Later Brehm (Isis, XXIII, 1830, p. 993, and Handl. Naturg. Vogel. Deutschl., pp. 746-750) recognized three species of the “Laroidae harengorum (Larus fuscus)," viz., melanotos, harengorum, and fuscus, saying that they all have a very dark mantle, and using the term slate-back ("schieferschwarz") to describe it, so here again it is evident that these names are pure synonyms of fuscus. Next in point of time is Macgillivray (Man. Brit. Orn., 1842, pt. II, p. 245), who, in describing "Larus flavipes, Yellow-footed Gull” says in part, "the back and wings blackish-gray tinged with purple or dark slate coloured." This description of the British bird applies to the form that Lowe called brittanicus, which has proved to be Reinhardt’s affinis, and it would be most appropriate to use “Yellow-footed Gull" for the popular name. Summing up, then, the first available scientific name for the grayer-backed bird is affinis of Reinhardt, and as there is complete intergradation of every character between affinis and fuscus there can be no question of two species. The skins I have examined show a little difference in the size of birds of the two races, although the difference in colour of the mantles is usually diagnostic. I would also call attention to another neglected character quite as good as any only less obvious, and that is the wing pattern. 10 adult males, wing 415-438 (423), tail 152-169 (160), tarsus 58-66 (63.6), toe without claw, 45-52 (49.1), culmen, 49-55 (52), depth of bill at base, 15-18 (1 G), at angle, 16-19 (16.5). 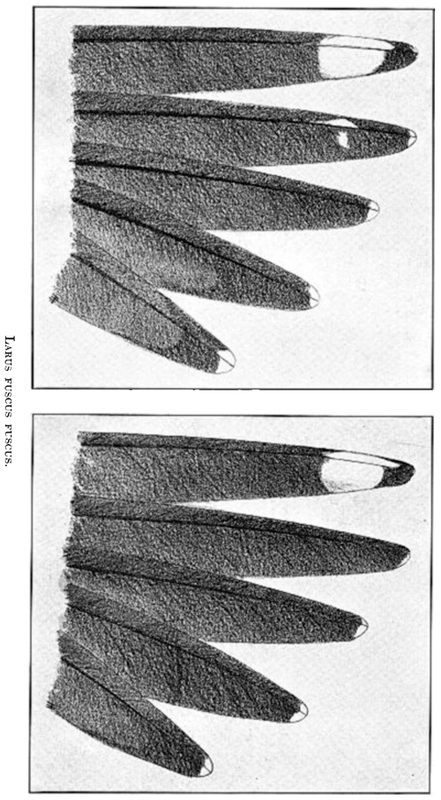 5 adult females, wing 394-410 (400.8), tail 142-159 (149.8), tarsus 57-60 (58.8), toe without claw, 42-17 (45), culmen, 45-48 (46.2), depth of bill at base, 14-16 (14.9), at angle, 15-17 (15.7). 4 adult females, wing 382-407 (392.2), tail 151-158 (155.7), tarsus 57-G6 (61), toe without claw, 42-51 (45.5), culmen, 44-50 (47.5), depth of bill at base, 14-15 (14.7), at angle, 15-16 (15.7). Heuglini adult, November 30 2009, northern Oman. Picture: Hans Larsson. Heuglini adult, November 19 2011, Eilat, Israel. Picture: Avi Meir. Heuglini adult, November 26 2010, Ashdod, Israel. Picture: Amir Ben Dov. Heuglini adult, November 06 2009, Ashdod, Israel. Picture: Amir Ben Dov. Heuglini adult, November 16 2009, Ashdod, Israel. Picture: Amir Ben Dov. Lesser Black-backed Gull adult, December 31 2010, Ashdod, Israel. Pictures: Amir Ben Dov.